That’s how my children refer to the flood that demolished our basement in August of 1999. The basement where we had relocated most of the toys that had taken over the main level of our house. The girls’ river of toys had flowed out of their bedroom, into our living room and kitchen and had even taken over our “office.” Hubby and I had had enough of the mess. We had never experienced Chicago flooding, though. And that long-ago storm was a doozy. We lost many treasures, including my childhood collection of Christmas tree ornaments and Hubby’s childhood comic book collection. 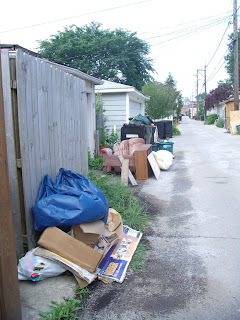 We carried out furniture and rugs and greeted our neighbors in the alley doing the same. We filled garbage bag after garbage bag of wet toys (mostly stuffed animals, including hard-to-replace Pound Puppies) and hauled those out, too. Not even five years old, our daughters bawled real tears as they picked up each soaked animal friend and cried out, “Not Teabag!” or “NO! Not Christopher!” It was a learning experience for all of us, and it traumatized our daughters. Floods come every few years now, so we have learned to live with them. I have awakened many times in the middle of the night to the sound of heavy rain, and rushed downstairs to put in the standpipe. The girls always keep their most beloved toys upstairs, and have learned to keep the basement reasonably tidy. But an impending storm is just about the only thing that motivates our daughters to get everything up off the basement floor (and they can really hustle when they need to). Anyway, yesterday’s microburst caused flooding, all over Chicago, and once again our neighborhood cleaned up. We didn’t lose too much. My daughters are eleven years old and very helpful in a crisis—still, one of them fought back tears when she realized we couldn’t save a stuffed pig she’s had since birth. I’m philosophical about Chicago weather, and now just view flooding as an efficient way to purge our house of junk. But the girls still curse the gods. And rue The Big F.
Hope you all survived. . . .
Cross posted at Chicago Moms Blog. My losses were minimal. One casualty was a cardboard box with some old stuffed animals that my stepdaughter had never unpacked-- I snuck them to the garbage yesterday while she was in camp. When Kim and I got married, I had to get hard-nosed about getting rid of things, so we would have the room for her stuff. I had the realization that there were things I'd never unpacked when I moved into this place in 1998, with another wife. I also realized that there were things I'd moved 3 or 4 times without ever using, or in some cases, unpacking. I made about 5 trips to Goodwill with my Blazer packed to the rafters. I haven't missed any of it. Kathy - I had no idea you had gone through so many floods. In my own little world, I thought it was just the Delaware River constantly flooding! Sometimes life throws some pretty awful things at us, but somehow we all get through it.